Thinking of heading into west Canada lakes area this week and I’m wondering about Whitney lake. 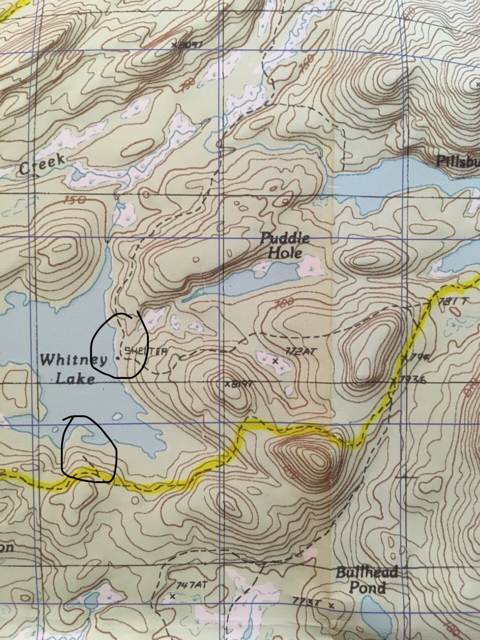 I know there’s no leanto, but I’m wondering if the second circled spur trail actually goes to the lake edge with a camping spot? I would like to visit Whitney and Sampson lake but I’m trying to figure out if that backtrack is necessary. That second spur is a little difficult to locate, but it begins near the old car chassis that is just off the trail. If in doubt just head downhill to where the old Sturges family camp remains are located in your circle. There is an old fire ring just to the east of the old camp remains, but by no means an attractive campsite imho. A bit late on this but wanted to chime in with some additional info that might be helpful if you haven't done this trip yet. 10 years ago, I was able to locate and follow the first spur on your map- the one from the French Louie Trail near Pillsbury Lake to the old lean-to site on Whitney Lake (and beyond even to Cedar Lakes). It was pretty brushy and hard to follow in spots even then. I understand that it has gotten some unofficial maintenance in the years since, but I would still expect any attempt to follow it to be more in line with a bushwhack than a hike on a maintained trail. I do recall there being a somewhat well established tent site at or near the old shelter site but my memory on this is super fuzzy. From what I recall, it was not a horrible site- but in the 10 years since, things may have changed. Whitney Lake was especially heavily impacted from groups coming in on float planes, which were allowed to continue landing there for some time even after Wilderness designation of the area (I want to say even well into the 90's). 10 years ago, the some of the sites on the lake were visibly still recovering. In the time since, given the significantly lower levels of use, some may have recovered to the point of being barely recognizable. I remember camping on the west shore of Whitney Lake for a night or two during that same time frame, but I honestly can't remember if I was in an established site or at a primitive site 150+ feet off the water. My memory of the south shore concur's with Justin's assessment- no nice campsites there. As I posted in the other Pillsbury Thread, it should be noted that any site on Whitney Lake is not going to be designated- and therefore technically isn't legal due to the site's proximity to the water. Until the West Canada Lakes UMP gets finished and approved (and provides some desperately needed clarification concerning the location of designated tent sites), I don't think any ranger would have an issue with a group using an already well-established tent site that has been in common usage for decades, and that the state has never tried to close (but again, please do not interpret my post as implicitly stating that it is OK to use any such site). It should also be noted, though, that there have been "No Camping" discs on the islands on Whitney Lake in the not-too-distant past, so those are definitely off-limits for camping. Also, concerning Sampson- It's alright. It must have been a pretty dry season the last time they relocated that lean-to, because there is a constant trickle of water that flows out from a seep located directly beneath the shelter. There's a couple of established tent sites that fit the "not designated and technically illegal but they've been in common usage for decades and the state has never tried to close them down" criteria- one west of the lean-to, and one back up on the French Louie Trail, east of the junction with the side trail to the lean-to and on the south side of the FLT. Sampson Lake itself is beautiful. What a difference a few years of internet info sharing has made on those paths! Also, concerning Sampson- It's alright. It must have been a pretty dry season the last time they relocated that lean-to, because there is a constant trickle of water that flows out from a seep located directly beneath the shelter. Yes, the Sampson lake lean-to was nice, but what we called our "stream" made it a muddy, wet mess directly in front of the lean-to. Sad to hear that about South Lake. It's not exactly like those trails are a big secret- they're shown on the USGS map, on the National Geographic Trails Illustrated map, and on the official DEC map for the West Canada Lakes Wilderness. Are they more obvious/well traveled now than they used to be? When I was back in the area two summers ago, I was able to locate the start of the path near Pillsbury Lake. I did not follow it very far, but it looked as bushy and overgrown as ever. I didn't end up going to Whitney, but it makes sense that since there's no lean-to there and limited camping spots, it would be less attractive and therefore less visited/abused. With exception of ‘18 I have visited Whitney every summer or fall for the past dozen years or so and yeah, the first few times trying to find & stay on the Whitney trail was pretty tricky, and I came off it several times and ended up bushwhacking the rest of the way. Same for my first few times trying to follow the Pillsbury Lake & Cedar Lakes legs. My next few times to the area I was sure to bring along my folding saw and did some minor blowdown clearing after finally figuring out the route(s). Then I think it was in the fall of ‘15 when I returned & discovered the paths had been completely opened up & cleared, including the trails back to Pillsbury & Cedars. I mean not even a log to step over! You could see lots of freshly cut logs & saplings along the routes, and a portion of the Pillsbury Lake leg was even rerouted a little further up the shoulder of Noisey Ridge. My last visit was in Sept. ‘17 and the paths were pretty much the same & easy to follow. However, the Whitney Lake leg appeared to be heavily traveled, with lots of mud wallows where people have been widening the trail a bit as they try to skirt around the mud, much like you see along the French Louie Trail & other popular trails. Someone (not me) even did some pretty fancy fireplace work at one of the campsites, with the remains of an old wood stove. (I actually met the guy(s) responsible and they were super nice). The beginning of the Whitney trail where it turns off the French Louie trail is still a little tricky to find if you’re unsure where to look for it, but other than that it was like a damn super highway. There’s also another old path marked with occasional blue paint markers that leads around the western end of Pillsbury back to the French Louie trail (which some newer maps show), but I haven’t tried following that in several years, last few times trying that one was enough for me lol... Holy spruce thickets! Edit note: I know many of us here have chatted about much of this before, and there have been several discussions in the various Whitney threads over the years on the topic, hence my internet comment. Last edited by Justin; 01-09-2019 at 10:33 AM.. I am planning my second excursion into the WCLW this summer. I'll have time and would like to get down to Whitney and camp for at least one night. How hard is it to find the trail? How is the fishing? I was thinking of bringing my packraft. Shoot me a pm if you wish. I’m definitely guilty of sharing perhaps too much info on this area publicly over the past few years, to the point where I’ve witnessed a noticeable difference since my early visits, but I’d be happy to help you out, and/or perhaps tag along. Sometimes finding out things on your own is fun too. The beginning of the Whitney trail where it turns off the French Louie trail is still a little tricky to find if you’re unsure where to look for it, but other than that it was like a damn super highway. It sounds like they used the classic trick of maintaining all but the first few hundred feet of a herd path, to intentionally make it hard for others to find/follow. One of the former AFRs in that area would occasionally mark the beginning of some of the old paths in the West Canadas region with a small cairn, thankfully he left that one alone.